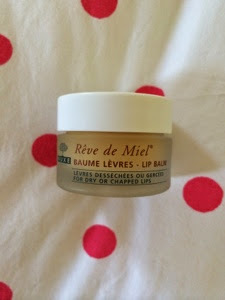 The Nuxe Reve De Miel Lip Balm is a beauty blogger cult product, I don't think I have read a bad review of this lip balm and I have read oh so many a review of this over the past 2 years. My review is going to be no different, I remember the first time I tried this, I bought my pot in November 2012 and dipping into that little pot of chocolate orange scented goodness was a bit of a life changer, it's amazingly moisturising and leaves lips with a matte satin finish which you don't often find and I actually prefer it to the glossy finishes you normally get with Lip Balms and within a couple of uses, my lips were smooth and soft rather than the dry, chapped lips i'd started with. I think my thing is Lip Balms, I love them, I'm not quite sure why, but it's one of my favourite things to buy and I always have about 6 in my bag, but this is definitely one of my favourite and the one I reach for if my lips are feeling particularly dry. As the name suggests one of the key ingredients in this is honey which is well known for it's moisturising properties, this also adds to the chocolate citrus honey scent that the lip balm has. Reve De Miel translates to Dream of Honey I believe which I think is suitably apt for this, it has quite a thick balmy texture and you have to work it into lips to almost melt it down and get it working. 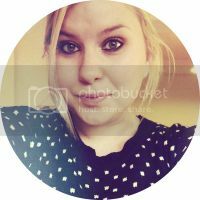 It also has a slightly gritty texture which almost feels a little like it is exfoliating your lips as you rub it in, but seems to melt down as well because you aren't left with any grittiness on your lips. This works amazingly in the winter to combat chapped dry lips but to be honest, I reach for it year round, I always have a pot in my bag and I already have my back up pot re-purchased. As I mentioned earlier, I have had this since November 2012 and it's still going strong, although I think I will have used it up within the next month or two, but it does last. I won't go into this too much more to be honest because you've probably all read the reviews by now but if you haven't tried this and are after a lip balm that really works rather than just coating the lips, give this a try. I picked mine up in SpaceNK for around £9. 5 comments on "REVIEW // Nuxe Reve De Miel Lip Balm"
You had me at chocolate orange scent! I've wanted this for ages but I think i need this now!